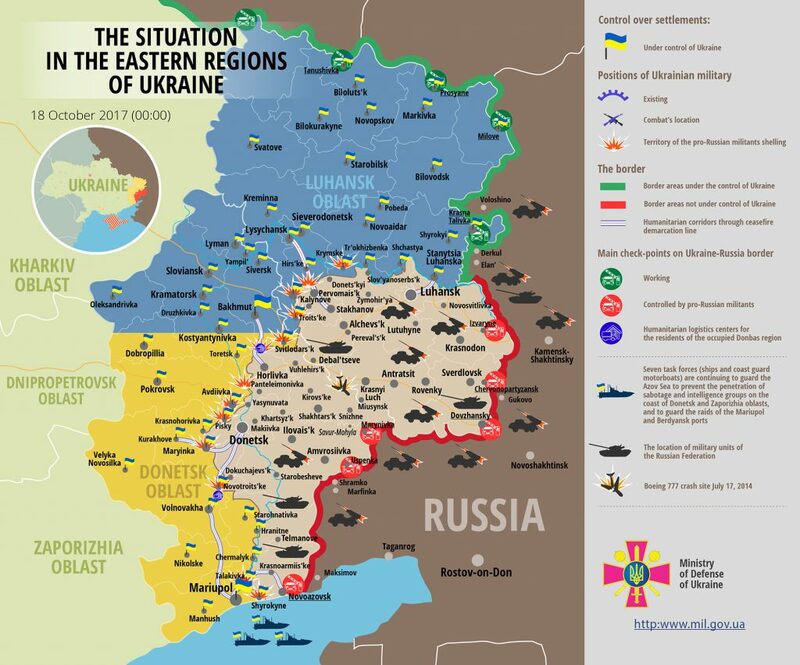 The situation escalated yet again in the ATO zone yesterday. Militants used Minsk-proscribed mortars of various calibers in all sectors, firing a total of 45 rounds. “The enemy conducted 44 attacks against Ukrainian Armed Forces’ positions along the entire frontline yesterday. Ukrainian troops mostly returned fire using weapons not prohibited under Minsk agreements,” reported Ukrainian Ministry of Defense spokesman on ATO Colonel Andriy Lysenko at a press briefing at Ukraine Crisis Media Center. Donetsk sector was the most restless yesterday. Russia-backed militants attacked Ukrainian troops 29 times. “In response to most of the attacks, Ukrainian troops were compelled to return fire using grenade launchers, heavy machine guns, and small arms,” said Col. Lysenko. After 15:00 militants mortared Ukrainian positions near Zaitseve, firing a total of 19 120-mm rounds. Moreover, Russian proxies attacked Ukrainian positions with anti-tank missiles, various grenade launchers, and small arms. “The enemy conducted six attacks on our strongholds near Avdiivka, three against Shakhta Butovka, three against Kamianka positions, and two against Pisky strongholds. Militants used grenade launchers and small arms in these incidents,” added the spokesman. “In Luhansk sector, the enemy conducted an intense two-hour attack starting 20:00 against our positions near Novooleksandrivka. Militants used IFV weapons, small arms, and 82-mm mortars, firing a total of 14 mortar rounds,” said Col. Lysenko. Moreover, militants attacked Krymske and Popasna with grenade launchers and small arms late at night. Ukrainian troops responded with fire using weapons not prohibited by Minsk agreements during each incident. In Mariupol sector, militants conducted 12 aimed attacks at Ukrainian strongholds. Near Hnutove Russian proxies fired six 120-mm mortar rounds at Ukrainian positions. Moreover, they shelled Ukrainian strongholds near Maryinka and Lebedynske with 82-mm mortars, firing three rounds in each case. Late at night, militants attacked Ukrainian positions near Novotroitske with IFV and mounted grenade launchers. “Moreover, the enemy attacked our troops with various grenade launchers and small arms near Vodiane, Shyrokyne, Talakivka, and Pavlopil. Ukrainian troops defeated each attack using mounted grenade launchers, heavy machine guns, and light weapons,” added the spokesman. As a result of hostilities, two Ukrainian servicemen were killed in action and four were wounded yesterday. Report on the military developments as of October 17 is available here. Interactive data on the shelling: chronology shelling chart and the interactive map.